In the football betting world, bookmaker debates are found at every corner, both online and offline. And why shouldn’t they be? Like in any productive, long-term relationship, every player needs a bookmaker which he can trust and use without hesitation, to become great and rake up profits. With the large variety of options easily available online today, picking the right betting agency can very hard. Assuming you’re looking for an online betting company, we have taken the liberty to review on of the biggest ones out there: Unibet. Unibet is a bookmaker which is part of the Kindred Group and was born in 1997. They now have more than 15 million customers from over 100 markets, and offer other things along betting as well: live betting, poker, a casino, and other games as well. They are a truly global powerhouse of the betting and gambling industry, although their primary focus is put on Europe and Australia. While their stats are most certainly impressive, players will be looking for a lot more benefits if they want to choose Unibet as their bookmaker. Let’s see what Unibet has installed for their new clients in the UK. Get Your £40 Welcome Bonus! We’ll choose to call it a sportsbook bonus, although you can take your winnings and play casino games as well. This bonus consists of two parts: a £40 money back as bonus and a £10 casino additional bonus. When you open a new account and make your first deposit, you will receive the casino bonus the following day. For the free bet, you will simply be reimbursed on your first losing bet, up to at most £40. In order to withdraw your bonus money, you must play through it at least 3 times in the sportsbook, on odds of at least 1.40, or at least 35 times in the casino. For more info about this bonus, we strongly recommend reading the terms and conditions below the bonus’ presentation through this link. Carefully reading the terms and conditions of these new bonuses will give you all the information you need and we haven’t covered in this short article. We strongly recommend giving them a look, just before opening a betting account with Unibet and starting using their website and mobile app. A few minutes of reading could mean the difference between scoring an awesome bonus and making lots of money and having an overall disappointing experience – take your time and study, and then go ahead and enjoy the ride! Although some bookmakers make playing and claiming bonuses a very hard job, Unibet treats this area very differently. Under the “My Account” tab, you’ll have a “bonus” tab, where you can easily opt in our out any bonus you currently qualify for. The bookmaker will also send you e-mail or phone notifications every time they have a new bonus for you, just to make sure you’re not losing any opportunities. The requirements for these bonuses are also extremely transparent and clear to understand, so you always know how to adapt your play style to win the bookmaker’s bonuses. We always favor transparency and lowsmall requirements over sheer gift size – what’s the use of a 300% welcome bonus if you have to play through it 17 times in 2 days? Football betting. The most interesting category for us is also the best-represented one at Unibet. They offer all the big leagues and competitions, as well as several other smaller ones. They offer betting slips for games from some of the most remote leagues on the planet, but they do tend to stick to only the top leagues of lesser-known nations, especially due to betting scandals and match fixing. Their betting options for a single game are also quite numerous: a player has the chance to pick his favorite from over 200 selections, and close to 300 if they game is a derby or one from the latter stages of a cup competition. Tennis betting. Their tennis category is certainly up to industry standards as well, with high odds for selections such as “Player X wins at least one set”. It’s very common for Unibet players to find at least one very attractive odd in every match. Furthermore, their livebet system for tennis works great, giving you access to quite a few betting systems which require vigilance and a quick finger. Basketball betting is also very well-represented at Unibet, with lots of games from the NBA and the European top leagues as well. Other sports are available with this bookmaker as well, from traditional ones like Ice Hockey, Cricket, Cycling, Rugby or Snooker to more unusual ones like E-sports, Surfing, and even Politics. For example, you can now place a bet on the winner of the French presidential election. One of our favorite things about Unibet is their odds calculator. Many other bookmakers calculate odds in order to have players gravitate towards a particular type of bet – outright, double chance, under/over, etc. They tend to use a smaller house edge in some areas and a larger one in others, meaning that you usually will find better odds for a particular category at another bookmaker. This is simply not the case for Unibet – they offer competitive odds in all categories, making them an ideal choice for a player looking to place all his bets with a single bookmaker. For example, even their over 0,5 goal / game bet has good odds, close to 1,10 for some games – compared to 1,02 – 1,03 in other bookmakers. We have also taken a look into Unibet’s methods in keeping up to speed with the development of the matches you can bet on. Their livescore system works almost flawlessly and updates very quickly, which was a big plus from our side. They also offer in-depth sports statistics for betting enthusiasts so that they can make a very well-informed selection of bets. Unibet also offers Watch&Bet sport streaming, from leagues like the Spanish La Liga, French Ligue 1 or Italian Serie A. This makes a Unibet account not only ideal for betting, but also for watching and betting on lots of sporting matches in the same time. Their in-play betting system also works great and has almost as many options as the classic betting slips, which makes Unibet one of the best bookmakers for live betting. 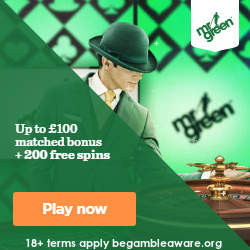 Claim Your £200 Deposit Bonus Here! Apart from their betting website, Unibet also has a very well-working online casino. As stated before, welcome bonuses for the casino section are excellent, and the array of games you can use these bonuses in is also great. Apart from the traditional Blackjack, Roulette or classic Slots games, Unibet offers its customers lots of other games to play, with various levels of interest. The casino welcome bonus has remained vastly the same in terms of idea, but the value has changed – it is now a 200% deposit welcome bonus, up to £200. You essentially triple your initial deposit and can land a hefty amount of bonus money. Be careful, however: in order to turn bonus money into real money, you have to play through it 35 times over the span of 30 days. Nothing too hard, we’re sure, but these conditions must be met in order for the bonus to work as intended. As always, we recommend sticking to classic games if you choose to visit their casino since they usually boast better win rates and are easier to understand – if you’re looking for profits. If a customer is looking for ways to spend time and has fun, Unibet’s large selection of casino games is ideal. Regarding deposits and withdraws, Unibet fares well compared to other bookmakers, although it’s not particularly impressive by any means. They offer traditional deposit options like credit card, bank transfer, prepaid cards, PayPal, Skrill, and others. Some of them are subject to a small commission, but this is no news, as most bookmakers have this commission active. Unibet also offers the opportunity to setup a deposit limit to control your spending. Withdrawals are handled very quickly by the staff, and you can usually see your winnings in your bank account in 1-2 working days, much sooner than the 3-5 business day interval specified on the website. If you ever do encounter an issue, though, or just need more information, Unibet offers lots of ways to contact them. They have a forum, where you can have a talk with Unibet employees and other players, an online chat which is open 24/7, and e-mail ([email protected]) and two phone numbers – 0800 329 393 for the UK and 0207 257 8701 for International calls. From our experience, the customer support at Unibet does its job very well. The agents are exceptionally polite and knowledgeable, and the wait times aren’t long at all. To sum up, we’d like to say that we found the reasons why Unibet is one of the biggest online bookmakers on the market right now. Their odds are good, their selections are excellent, and we strived to find a single category where they failed. We were especially impressed by the large selection of high odds for betting, since most bookmakers offer great odds in just one or two categories. Unibet has risen over them and offer competitive odds almost across the board – couple this with easy deposits and excellent customer support, and you’ve got yourself a very reliable betting partner. Even if you favor multi-broker betting systems, an account at Unibet is something you shouldn’t lack.